NTT DOCOMO, INC. (DOCOMO) announced today that it will offer Japan Welcome SIMTM cards—prepaid SIM cards for overseas visitors to Japan—to all press and media representatives attending the World Press Briefing1 of the Olympic and Paralympic Games Tokyo 2020, which will take place in Tokyo from September 4 to 7. As a Tokyo 2020 Gold Partner for telecommunications services, DOCOMO is currently considering the provision of various Games-related information services to overseas visitors to Japan who use DOCOMO prepaid SIM cards during the Tokyo 2020 Games. In advance of the Games, DOCOMO will provide Japan Welcome SIM cards to attendees at the forthcoming World Press Briefing in order to obtain feedback on service quality and functionality, with the aim of improving these prior to actual launch. In 2020, DOCOMO is considering offering the service via its free-of-charge “Plan 0” subscription, which will carry commercials but will offer overseas visitors free 4G access throughout Japan; users will be required to use their phones to check information and for various other functions during the Tokyo 2020 Games. Going forward, DOCOMO aims to continue leveraging advanced technologies to offer a variety of network services and support to overseas visitors to Japan. World Press Briefing (WPB) is an event that provides an opportunity for the Tokyo 2020 Organising Committee to share information on progress in preparations for the Olympic and Paralympic Games with both international and domestic journalists and photographers. 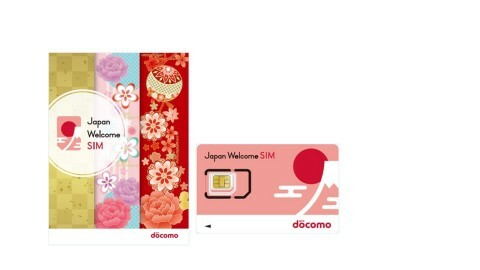 “Japan Welcome SIM” is a trademark of NTT DOCOMO, INC.
Japan Welcome SIM is a prepaid SIM service providing visitors to Japan with data access on NTT DOCOMO’s network. Limited to certain areas of Japan. The above-mentioned network speed is the maximum specified in the technical standard, not the actual speed. Service is provided a best-effort basis, with actual network speed being subject to the network environment and traffic conditions. The maximum speed also varies depending on device used. “FOMA” is trademark of NTT DOCOMO, INC.
NTT DOCOMO, Japan's leading mobile operator with over 76 million subscriptions, is one of the world's foremost contributors to 3G, 4G and 5G mobile network technologies. Beyond core communications services, DOCOMO is challenging new frontiers in collaboration with a growing number of entities ("+d" partners), creating exciting and convenient value-added services that change the way people live and work. Under a medium-term plan toward 2020 and beyond, DOCOMO is pioneering a leading-edge 5G network to facilitate innovative services that will amaze and inspire customers beyond their expectations. DOCOMO is listed on the Tokyo Stock Exchange (9437). www.nttdocomo.co.jp/english.